I love the city of Amsterdam, and when a new attraction presents itself in the area, what better excuse to take a few days off and go check it out. 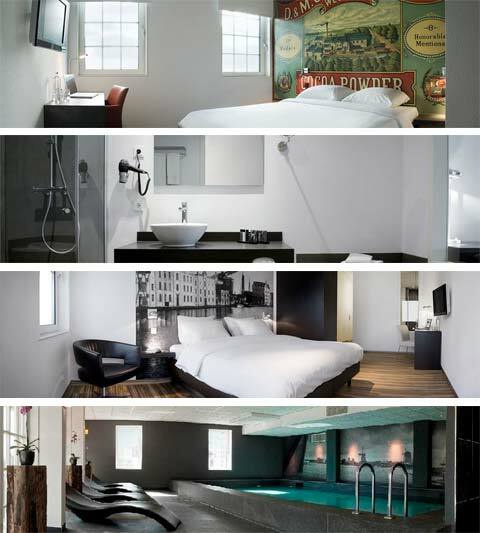 Located just 12 minutes by train from the center of Amsterdam, the new Inntel hotel is literally a temporary home for traveling guests. 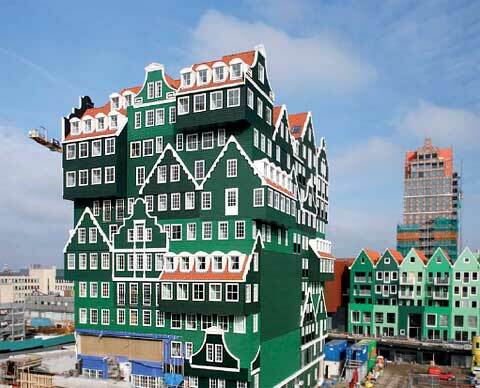 Inspired by the traditional green wooden houses of the Zaan region, this extraordinary boutique hotel is build up from almost 70 individual small houses, perfectly stacked, one on top of the other in four shades of green. 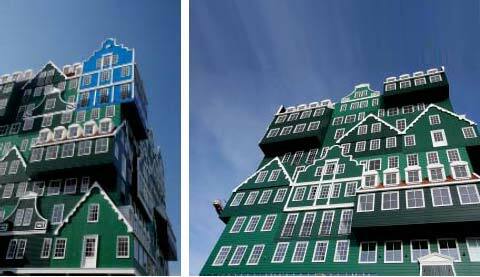 This eye-catching structure is a great example for the architect Wilfried van Winden approach, called “Fusion Architecture”. The elegant and sophisticated interior design of this unique hotel is quite different from its unusual exterior. Spanning over 12 floors, you will find 160 guest rooms with beautiful modern designed interiors, a brasserie- restaurant with a terrace on the water, swimming pool, and wellness center with a Finnish sauna, a Turkish bath and tropical rain shower. I love it…. Leave to the Dutch !! You guys never fail to amaze me…. I’m so damn proud to be a frickin’ Dutchman….Born in Noordschans~ Moerdijk Noord Brabant…..Oranje Boven ! !